In 2015 the masses of Nigeria voted Buhari as president to lead the country out of several fronts , stop the deadly Boko haram, provide security, electricity, roads, hospitals and good governance. Except for Boko Haram, where I will score Buhari a pass mark, today, on all other fronts he has done abysmally poor, but hypocrisy has not allowed my people see. We have seen how inflation is eating up our little resources, power failures are damaging our businesses, insecurity especially kidnapping and herdsmen/farmer crisis is crippling commerce. With Abuja, Niger, kaduna to kano express road worst hit by the kidnapping menace. 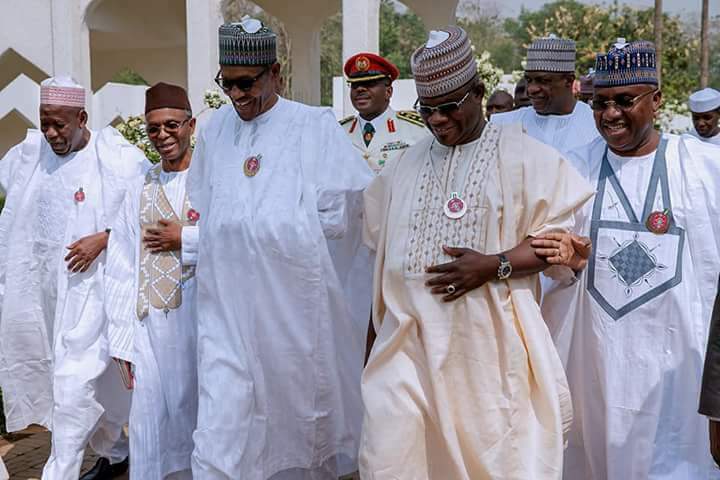 The Governors on this “express road of evil” instead of gathering themselves to meet the president to push for stiffer, tighter security and penalties on such crimes, they sheepishly and shamelessly go to him to tell him come out and contest for another term in 2019, then when incidence happen, they start shouting “politicization” by opponents. Why can’t they ask that the same network of security be provided on that road as was provided when the Abuja airport was moved to Kaduna? Why can’t the Governors tell the President that AEDC is not providing their people with electricity? why can’t the Governors tell Mr President that the farmers are not getting subsidies? Why can’t the Governors tell the President that their citizens can’t pay for WAEC and NECO? They couldn’t even tell him that food prices are too high for he masses to afford, all they gathered to tell him was he was doing well and should contest again in 2019. Mr President, sorry to tell you these, those Governors who came to see you are liars, inept and double speaks. They have left poor teachers in their states protesting, pensioners protesting, youth protesting, farmers being killed and citizens starving. Mr. President if truth be told your performance is below average and you have reached your peak, no matter the effort you might want to put in now it will be affected by law of diminishing return, you can’t do anything better even if you are given another eight years to make it twelve years . A tasty person begin to loosen his taste continuesly as he comsumes more water till he drops the cup. At this point you ought to know that Nigerians are full with your effort and need a new hand or taste. Leaders who are power hungry do not heed advises like ours, but check their termination points, IBB dribbled for eight years but ended up stepping aside permanently! Obasanjo orchestrated “term agenda” did It succeed? No! He still carries his albatross around town, Jonathan promised to serve a term but later shamelessly denied his own promise but what happened? 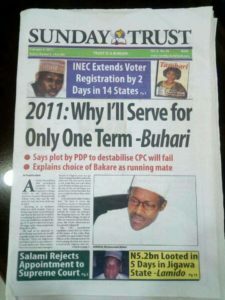 You too promised one term since 2011, but now you are trying hard to recoil just like you have denied all promises you made. Mr President should know better that the sign of an expiring Government is already telling in all facets of his administration, several motions without movement, propagandas are no more believed, ministers like Lai, Fashola, et al, are no more trusted, party men are decamping, the three arms are at each other’s neck, spending with no result, arrest of opponents, media aids insulting voices of reason and lastly the President is caged in the Villa, check out, that is the usual chain of events before any Government come to an end. Mr President should also be told that in the past, it wasn’t Governors with excess baggage of unfulfilled promises that came to tell him to contest, it was the ordinary citizens but now the elites have claimed him and he himself has allowed it. Mr President, age is not on your side, your ideas are exhausted, your reputation and popularity is in steady decline, issues are compounding, Nigerians are becoming restless, you too confirmed it in your New year speech even though Nigerians have shown you patience. Mr President just take a bow as there is nothing new you can try, this is why civil servants are retired at 65/70 or after working for 35 years. Ideas are exhausted,issues are compounding.